At the DIA we have, dated 1861-1868: New water supply scheme for Dublin, Pembroke and Blackrock, consisting of large storage reservoir with capacity of 84,000,000 gals. at Roundwood, filter beds, tunnel to Callowhill and pipe to Stillorgan. Permission for a pipe to replace the 150 year old tunnel was granted in 2017. Reverse view L_ROY_00539 show that the tunnel used to be open, too. Another reverse view shows the same family (missed the wife on the kitchen chair at right first time!). I think they are a family living in the little house shown. To the census! A Description of the Dublin Corporation Water Works by Parke Neville, dating from 1875, even including a map showing a tank at Callow Hill. The Geoghegans, perhaps. Murtagh (caretaker), his wife Mary, and one of their sons, John or Murtagh Jr. In [https://www.flickr.com/photos/scorbet]'s document we learn of this Tank: The water is measured six times daily by a floating meter. This is presumably part of the caretaker's job. The 1901 entry reveals more young Geoghegans, Thomas and Patrick, older than John and Murtagh. Landowner on the 1901 buildings form is given as D. Cor Watr Works Com, and in 1911 as Dublin Corporation Water Works. If the young man is John at 6, this is earliest 1900. If it is Murtagh Jr. aged 10, this is latest 1911. On 539 linked above, there is a round plaque to the right of the tunnel, somewhat blurred, saying DUBLIN CORPORATION WATER WORKS THIS TUNNEL illegible Sir John Gray is on there (Sharon's doc is dedicated to him) as well as Parke Neville the engineer (Sharon's author and the DIA engineer). [https://www.flickr.com/photos/gnmcauley] Engineers Ireland has a history of the Dublin water and drainage schemes here which includes more info on who all the people are including both Sir John Grey and Parke Neville. That is an impressive 'water feature' the Geoghegans have in their garden! ... At the northern end of the tunnel, at Callow Hill, a cast-iron gauge weir, with a sharp edge of the most approved section, has been erected for registering the quantity of water passed down daily for the supply of the City and suburban districts. The water is measured six times daily by a floating meter. The weir is divided into two bays 10 feet each in length, over which the water falls into a circular basin 86 feet in diameter and 10 feet deep. 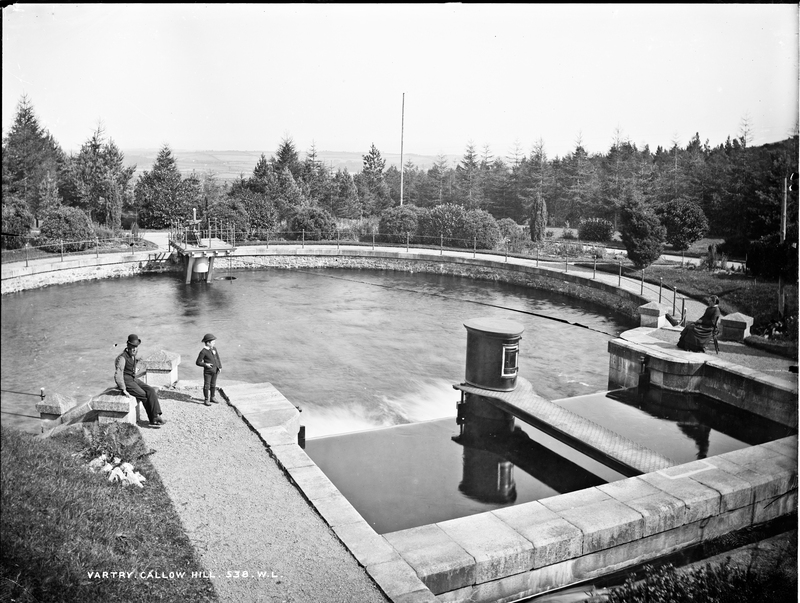 The level of the water in this tank, when full, is 602 feet above Ordnance datum, and from it a main 33 inches in diameter conveys the water to the service reservoirs at Stillorgan. Several carefully nade experiments have proved that the quantity of water, calculated by the usual formula for ascertaining the flow of water over weirs, was larger than the amount actually discharged by about 8 per cent. ... ... At each tank, and also at Callow Hill, there are self-acting drop valves to shut off the water in case of the pipes bursting. Are those the 'floating meter' and the 'self-acting drop valve' (see notes) ? [https://www.flickr.com/photos/beachcomberaustralia] Yes, in megazoom you can see that the post in the centre of the weir has a little locked door in it with a catwalk out to it. 6 times a day, Mr. Geoghegan would walk out there, open the little door, and record the height of the water flowing over the weir. Then this measurement plugged into the weir formula would give the flow rate. Well done Mary for keeping the show on the road.....more Dogs please. [https://www.flickr.com/photos/gnmcauley] I had a look at marriage and birth records for the Geoghegans. At his marriage in 1892, Murtagh Geoghegan is down as a labourer, but by 1893 at Thomas’ birth, he’s a caretaker. His address in 1892 is simply Callow Hill, but in 1893 he’s at “Tank House”. Erected | by | MURTAGH GEOGHEGAN | Tank House Callowhill | in loving memory of his wife MARY | died 3rd May 1932 aged 68 yrs. | also the above | MURTAGH GEOGHEGAN | died 14th Nov. 1938 aged 76 yrs. | R.I.P. Excellent stuff as usual. Thanks all! Really pleasantly surprised with confirmation of the people pictured. A welcome and fantastic bonus! Map, tags, description, etc all updated :) FYI - As mentioned recently, the image posted tomorrow (Wednesday) will be the last for a couple of days. Normal service will resume next week.